Racing Metro have announced five new signings ahead of next season alongside 11 players re-committing their future to the club. The Top 14 transfer window opened last Friday and various sides have been announcing their own signings. The likes of Castres, Montpellier and Toulon have revealed some of their recruitment and Metro have now announced five new faces. 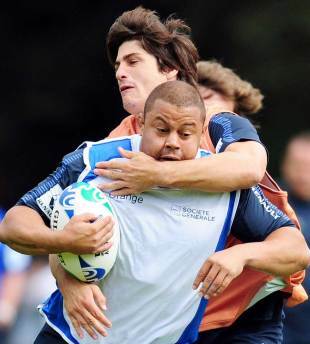 France prop Luc Ducalcon is perhaps the most eye-catching of the signings and he will be joined at the club by Brive fly-half Mathieu Belie, Montpellier flanker Masi Matadigo, Agen scrum-half Maxime Machenaud and Beziers' Camille Gerondeau. The club have also received a boost with the news that star playmaker Juan Martin Hernandez has penned a new three-year extension. He is joined by fellow Puma Juan Jose Imhoff and France centre Fabrice Estabenez on new deals. The other eight who have re-committed are: François Van der Merwe, Jacques Cronje, John Leo'o, Antoine Battut, Mikaele Tuugahala, Andréa Lo Cicero, Julien Brugnaut and Eddy Ben Arous. While Racing have handed out new contracts to the 11, they have also announced five departures. Nicolas Durand, Mathieu Lorée, Josh Matavesi, Scott Zimmermann and Gregory Arganese will all leave Metro at the end of the current season. One other player who will not be at Racing next season is lock Lionel Nallet. He has been linked with a move to the now relegated Lyon and Nallet confirmed the switch on Tuesday. Nallet said: "I am very happy and proud to be joining Lyon, a team with great potential, and to be back playing again with my friend and teammate from Racing Metro, Sebastien Chabal."